Looking for that retro feel? A complete guide to our Audio Cassette production can be downloaded here. All artwork must be to our specifications (available by request). Completed artwork can be uploaded here. Our preference for Master Tracks are 16 bit 44.1kHz WAV files but we can also accept, mp3, flac, wma, aif, m4a all of which can be uploaded here. Payment is with order by Bank Transfer or Paypal. All tapes are recorded in real time. Our preference is for you to send us 16 bit 44.1kHz WAV files. If you have a specific sound you are looking to achieve or are worried about how your tapes will sound, we strongly recommend that you order a proof cassette before you go ahead with the order so that you know how your tapes are going to sound. Proof tapes do cost either €20 for an unprinted audio-only copy. Please note that adding a proof cassette to the order may add upto 10 days to the total production time and the proof cassette may not be wound to the precise length that you need for your order, so there may be some additional silence at the end of each side. All of our cassettes are standard high quality ferric tape. Chrome tapes are getting harder to source and are not available at this time. For other options please complete our enquiry form to receive a full quotation. At Copysmith we produce only gloss finished discs utilising *JVC (Taiyo Yuden) media. For us, this means not only are we producing the best quality disc for our clients, but we are also providing a gloss printed finish at no extra charge. This adds to the professional look of your presentation. BD-R – BD 25GB and BD 50GB. Please view The Gallery to see our CD, DVD & Blu-Ray packing options. *Blu-Ray discs may differ and be manufactured by alternative sources without a gloss print finish. Read more about our duplication services for retro formats. Copysmith of Swords, North County Dublin, Ireland provides CD duplication services for the counties of Laois Mayo, Meath, Monaghan, Offaly, Roscommon, Sligo, Tipperary, Waterford, Westmeath, Wexford, Wicklow, Carlow, Cavan, Clare, Cork, Donegal, Dublin, Galway, Kerry, Kildare, Kilkenny, Leitrim, Limerick, Longford and Louth. Copysmith of Swords, North County Dublin, Ireland provides CD replication services for the counties of Laois Mayo, Meath, Monaghan, Offaly, Roscommon, Sligo, Tipperary, Waterford, Westmeath, Wexford, Wicklow, Carlow, Cavan, Clare, Cork, Donegal, Dublin, Galway, Kerry, Kildare, Kilkenny, Leitrim, Limerick, Longford and Louth. Copysmith of Swords, North County Dublin, Ireland provides DVD duplication services for the counties of Laois Mayo, Meath, Monaghan, Offaly, Roscommon, Sligo, Tipperary, Waterford, Westmeath, Wexford, Wicklow, Carlow, Cavan, Clare, Cork, Donegal, Dublin, Galway, Kerry, Kildare, Kilkenny, Leitrim, Limerick, Longford and Louth. Copysmith of Swords, North County Dublin, Ireland provides DVD replication services for the counties of Laois Mayo, Meath, Monaghan, Offaly, Roscommon, Sligo, Tipperary, Waterford, Westmeath, Wexford, Wicklow, Carlow, Cavan, Clare, Cork, Donegal, Dublin, Galway, Kerry, Kildare, Kilkenny, Leitrim, Limerick, Longford and Louth. Copysmith of Swords, North County Dublin, Ireland provides BD-R or Blu-Ray duplication services for the counties of Laois Mayo, Meath, Monaghan, Offaly, Roscommon, Sligo, Tipperary, Waterford, Westmeath, Wexford, Wicklow, Carlow, Cavan, Clare, Cork, Donegal, Dublin, Galway, Kerry, Kildare, Kilkenny, Leitrim, Limerick, Longford and Louth. Copysmith of Swords, North County Dublin, Ireland provides Blu-Ray replication services for the counties of Laois Mayo, Meath, Monaghan, Offaly, Roscommon, Sligo, Tipperary, Waterford, Westmeath, Wexford, Wicklow, Carlow, Cavan, Clare, Cork, Donegal, Dublin, Galway, Kerry, Kildare, Kilkenny, Leitrim, Limerick, Longford and Louth. Copysmith of Swords, North County Dublin, Ireland provides USB duplication or data loading services for the counties of Laois Mayo, Meath, Monaghan, Offaly, Roscommon, Sligo, Tipperary, Waterford, Westmeath, Wexford, Wicklow, Carlow, Cavan, Clare, Cork, Donegal, Dublin, Galway, Kerry, Kildare, Kilkenny, Leitrim, Limerick, Longford and Louth. Copysmith of Swords, North County Dublin, Ireland provides 3.5″ DS HD floppy disk duplication services for the counties of Laois Mayo, Meath, Monaghan, Offaly, Roscommon, Sligo, Tipperary, Waterford, Westmeath, Wexford, Wicklow, Carlow, Cavan, Clare, Cork, Donegal, Dublin, Galway, Kerry, Kildare, Kilkenny, Leitrim, Limerick, Longford and Louth. 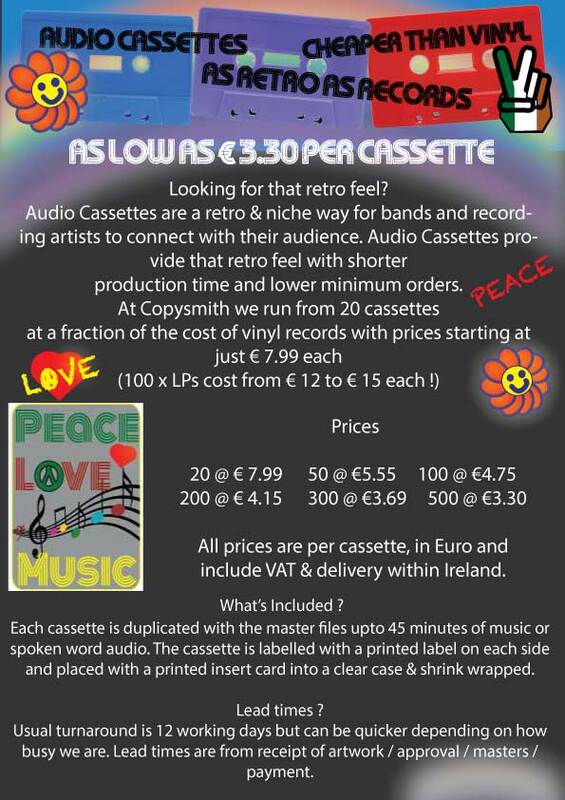 Copysmith of Swords, North County Dublin, Ireland provides Audio Cassette duplication services for the counties of Laois Mayo, Meath, Monaghan, Offaly, Roscommon, Sligo, Tipperary, Waterford, Westmeath, Wexford, Wicklow, Carlow, Cavan, Clare, Cork, Donegal, Dublin, Galway, Kerry, Kildare, Kilkenny, Leitrim, Limerick, Longford and Louth. Distributing the Epson Range of Disc Producers Copysmith of Swords, North County Dublin, Ireland, provides automated disc publishing systems to print and duplicate CD, DVD and Blu-Ray discs for the counties of the Republic of Ireland, Longford, Louth, Laois, Mayo, Meath. Distributing the Epson Range of Disc Producers Copysmith of Swords, North County Dublin, Ireland, provides automated disc publishing systems to print and duplicate CD, DVD and Blu-Ray discs for the counties of the Republic of Ireland, Monaghan, Offaly, Roscommon, Sligo, Tipperary, Waterford. Distributing the Epson Range of Disc Producers Copysmith of Swords, North County Dublin, Ireland, provides automated disc publishing systems to print and duplicate CD, DVD and Blu-Ray discs for the counties of the Republic of Ireland, Westmeath, Wexford, Wicklow, Carlow, Cavan. Distributing the Epson Range of Disc Producers Copysmith of Swords, North County Dublin, Ireland, provides automated disc publishing systems to print and duplicate CD, DVD and Blu-Ray discs for the counties of the Republic of Ireland, Clare, Cork, Donegal, Dublin, Galway. Distributing the Epson Range of Disc Producers Copysmith of Swords, North County Dublin, Ireland, provides automated disc publishing systems to print and duplicate CD, DVD and Blu-Ray discs for the counties of the Republic of Ireland, Kerry, Kildare, Kilkenny, Leitrim and Limerick. Canon CD and DVD Disc printers Monaghan. Canon CD and DVD Disc Printers Cavan. Canon CD and DVD Disc printers Louth. Canon CD and DVD Disc Printers Leitrim. Canon CD and DVD Disc printers Limerick. Canon CD and DVD Disc Printers Longford. Canon CD and DVD Disc printers Laois. Canon CD and DVD Disc Printers Meath. Canon CD and DVD Disc printers Westmeath. Canon CD and DVD Disc Printers Dublin. Canon CD and DVD Disc printers Carlow. Canon CD and DVD Disc Printers Kildare. Canon CD and DVD Disc printers Wicklow. Canon CD and DVD Disc Printers Wexford. Canon CD and DVD Disc printers Waterford. Canon CD and DVD Disc Printers Cork.Canon CD and DVD Disc printers Kerry. Canon CD and DVD Disc Printers Clare. Canon CD and DVD Disc printers Galway. Canon CD and DVD Disc Printers Sligo. Canon CD and DVD Disc printers Mayo. Canon CD and DVD Disc Printers Donegal. Canon CD and DVD Disc printers Roscommon. Canon CD and DVD Disc Printers Tipperary. Canon CD and DVD Disc printers Offaly. Canon CD and DVD Disc Printers Kilkenny. Mug printers Monaghan. Mug Printers Cavan. Mug printers Louth. Mug Printers Leitrim. Mug printers Limerick. Mug Printers Longford. Mug printers Laois. Mug Printers Meath. Mug printers Westmeath. Mug Printers Dublin. Mug printers Carlow. Mug Printers Kildare. Mug printers Wicklow. Mug Printers Wexford. Mug printers Waterford. Mug Printers Cork.Mug printers Kerry. Mug Printers Clare. Mug printers Galway. Mug Printers Sligo. Mug printers Mayo. Mug Printers Donegal. Mug printers Roscommon. Mug Printers Tipperary. Mug printers Offaly. Mug Printers Kilkenny. Copysmith of Swords, North County Dublin, print promotional mugs, posters and canvas from files and photos, for corporate business, or as gifts and presents for family and friends, for the counties of Limerick, Longford, Louth, Laois Mayo, Meath, Monaghan, Offaly, Roscommon, Sligo, Tipperary, Waterford, Westmeath, Wexford, Wicklow, Carlow, Cavan, Clare, Cork, Donegal, Dublin, Galway, Kerry, Kildare, Kilkenny and Leitrim . Based in Swords, North County Dublin, Copysmith distribute a range of Canon Office Printers that also print CD, DVD and Blu-Ray (BD-R) , for the counties of Kilkenny, Leitrim, Limerick, Longford, Louth, Laois Mayo, Meath, Monaghan, Offaly, Roscommon, Sligo, Tipperary, Waterford, Westmeath, Wexford, Wicklow, Carlow, Cavan, Clare, Cork, Donegal, Dublin, Galway, Kerry and Kildare. CD Duplication Kilkenny, CD Duplication Leitrim, CD Duplication Limerick, CD Duplication Longford, CD Duplication Louth, CD Duplication Laois,CD Duplication Mayo, CD Duplication Meath, CD Duplication Monaghan, CD Duplication Offaly, CD Duplication Roscommon, CD Duplication Sligo, CD Duplication Tipperary, CD Duplication Waterford, CD Duplication Westmeath, CD Duplication Wexford,CD Duplication Wicklow, CD Duplication Carlow,CD Duplication Cavan,CD Duplication Clare, CD Duplication Cork,CD Duplication Donegal,CD Duplication Dublin,CD Duplication Galway, CD Duplication Kerry, CD Duplication Kildare. DVD Duplication Kilkenny, DVD Duplication Leitrim, DVD Duplication Limerick, DVD Duplication Longford, DVD Duplication Louth, DVD Duplication Laois,DVD Duplication Mayo, DVD Duplication Meath, DVD Duplication Monaghan, DVD Duplication Offaly, DVD Duplication Roscommon, DVD Duplication Sligo, DVD Duplication Tipperary, DVD Duplication Waterford, DVD Duplication Westmeath, DVD Duplication Wexford,DVD Duplication Wicklow, DVD Duplication Carlow,DVD Duplication Cavan,DVD Duplication Clare, DVD Duplication Cork,DVD Duplication Donegal,DVD Duplication Dublin,DVD Duplication Galway, DVD Duplication Kerry, DVD Duplication Kildare. BD-R Duplication Kilkenny, BD-R Duplication Leitrim, BD-R Duplication Limerick, BD-R Duplication Longford, BD-R Duplication Louth, BD-R Duplication Laois,BD-R Duplication Mayo, BD-R Duplication Meath, BD-R Duplication Monaghan, BD-R Duplication Offaly, BD-R Duplication Roscommon, BD-R Duplication Sligo, BD-R Duplication Tipperary, BD-R Duplication Waterford, BD-R Duplication Westmeath, BD-R Duplication Wexford,BD-R Duplication Wicklow, BD-R Duplication Carlow,BD-R Duplication Cavan,BD-R Duplication Clare, BD-R Duplication Cork,BD-R Duplication Donegal,BD-R Duplication Dublin,BD-R Duplication Galway, BD-R Duplication Kerry, BD-R Duplication Kildare. BLU-RAY Duplication Kilkenny, BLU-RAY Duplication Leitrim, BLU-RAY Duplication Limerick, BLU-RAY Duplication Longford, BLU-RAY Duplication Louth, BLU-RAY Duplication Laois,BLU-RAY Duplication Mayo, BLU-RAY Duplication Meath, BLU-RAY Duplication Monaghan, BLU-RAY Duplication Offaly, BLU-RAY Duplication Roscommon, BLU-RAY Duplication Sligo, BLU-RAY Duplication Tipperary, BLU-RAY Duplication Waterford, BLU-RAY Duplication Westmeath, BLU-RAY Duplication Wexford,BLU-RAY Duplication Wicklow, BLU-RAY Duplication Carlow,BLU-RAY Duplication Cavan,BLU-RAY Duplication Clare, BLU-RAY Duplication Cork,BLU-RAY Duplication Donegal,BLU-RAY Duplication Dublin,BLU-RAY Duplication Galway, BLU-RAY Duplication Kerry, BLU-RAY Duplication Kildare. BLU RAY Duplication Kilkenny, BLU RAY Duplication Leitrim, BLU RAY Duplication Limerick, BLU RAY Duplication Longford, BLU RAY Duplication Louth, BLU RAY Duplication Laois,BLU RAY Duplication Mayo, BLU RAY Duplication Meath, BLU RAY Duplication Monaghan, BLU RAY Duplication Offaly, BLU RAY Duplication Roscommon, BLU RAY Duplication Sligo, BLU RAY Duplication Tipperary, BLU RAY Duplication Waterford, BLU RAY Duplication Westmeath, BLU RAY Duplication Wexford,BLU RAY Duplication Wicklow, BLU RAY Duplication Carlow,BLU RAY Duplication Cavan,BLU RAY Duplication Clare, BLU RAY Duplication Cork,BLU RAY Duplication Donegal,BLU RAY Duplication Dublin,BLU RAY Duplication Galway, BLU RAY Duplication Kerry, BLU RAY Duplication Kildare.